All the latest news from Elton House. 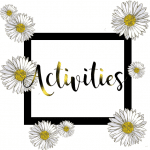 Activities| Lovely week planned at Elton House! Activitites| Everyone welcome to take part in all the lovely activities at Elton House!